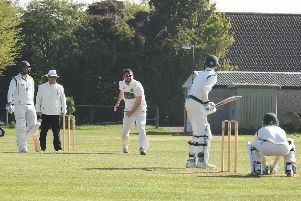 The Boston and Skegness EBA Bowls League season has kicked off in Division One with four matches and BBC on a bye week. With the three frontrunners likely to be Burton House, Skegness Foreshore, and Sleaford Road the fixture between Burton House and visitors Foreshore was the plum game and the visitors were victors 8-2. Ian Morris and Gary Kitchen skipped their rinks to good wins whilst Richard White’s rink got the two points for Burton House. Sleaford Road made a strong start with a 10-0 Victory at home to Suncastle BC. The derby between Wrangle and Friskney saw the visitors take the points 8-2 with Alan Brummitt and Ernie Elkington having good wins and Wrangle captain Jeff Skelton’s rink getting the two points. Stickney and West End fought a close game, with West End edging it 6-4. Stickney skips Roy Rout and Alan Harrison won but could not cover the aggregate of West End skip Mick Dodes. Division Two commences this week where the favourites will perhaps be Horncastle to bounce straight back, but they will be pushed by Frieston and Forbes Road. West Skirbeck will not be fulfilling fixtures due to closure.